“Splash Cash” Cards Now Available. Each card is initially set with a $25 value, and can be “reloaded” throughout the year. Perfect for gifts. Convenient to give to children. The card never expires, so you can use any remaining balances in 2018 (or beyond). Click here to purchase Splash Cash. Not responsible for lost or stolen cards. 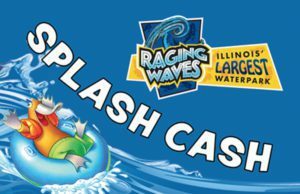 Splash Cash cannot be used for ticket purchases, locker rentals, or any online purchases.